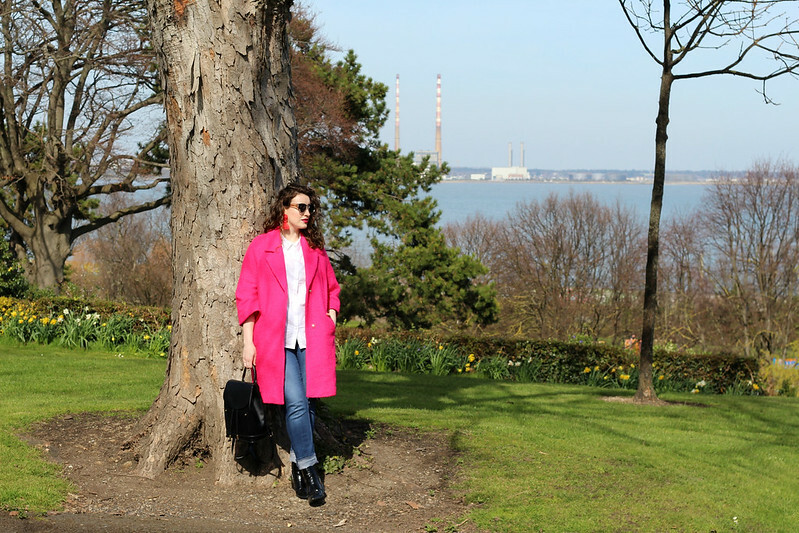 It's been a while since my last style post and I'm completely blaming the Irish weather. Every time I had a free day to do it, the weather was rainy, windy or horribly cold. 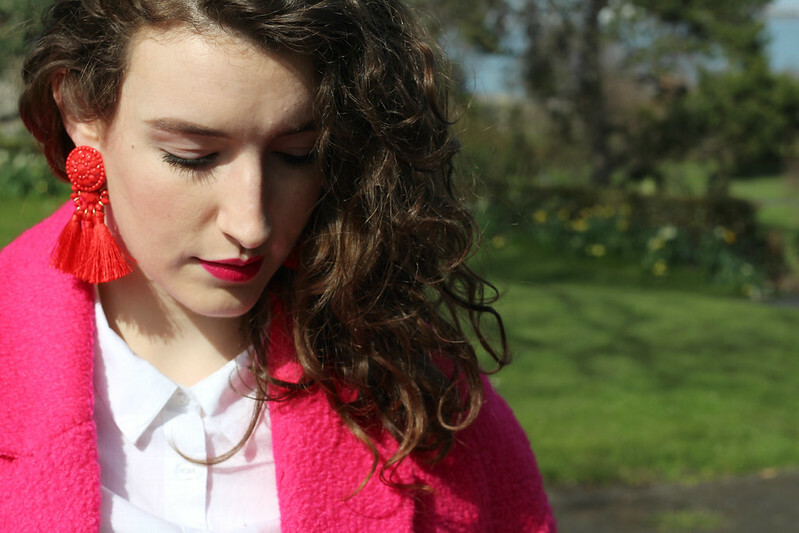 Which is why I wanted my first outfit post of Spring to be a colourful one. 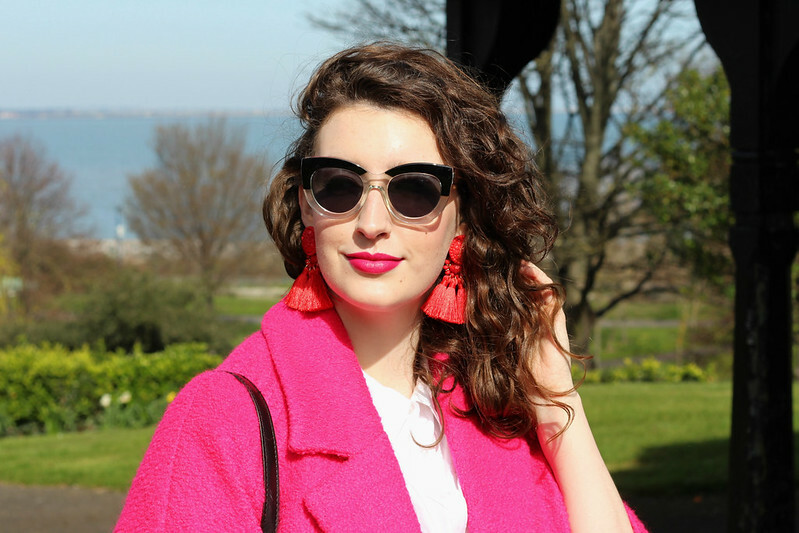 I bought these earrings in H&M last week and I immediately pictured myself wearing them with clashing bright pink. You may remember I have the white ones too which I wore in this post last Summer. 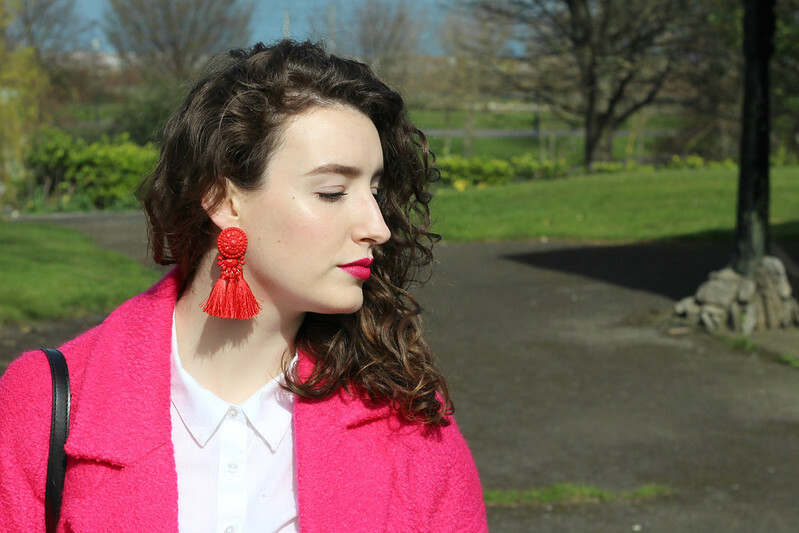 This is the fourth time I've styled tassel earrings in outfit photos over the past year (seen in this post and this one) all of which happen to be from H&M. I just love how much of a statement they make, I can see myself wearing these with dresses in the Summer too like I did with my white ones when I was in France last year. The clashing colours trend, particularly with pink and red is one of my favourites this year and I was excited to try it myself. 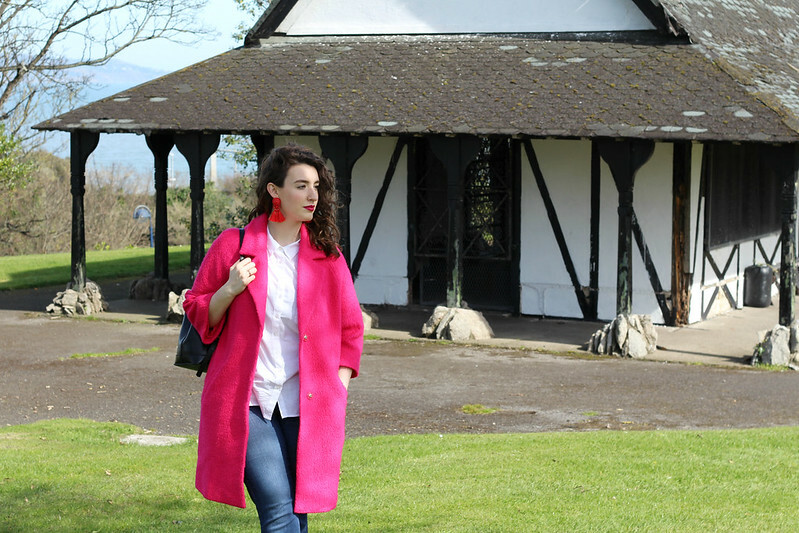 Between the earrings, coat and lipstick there is a lot going on here which I love, but it meant I wanted to keep the rest of my outfit very pared back with a white shirt and jeans. These sunglasses are my favourite purchase of last Summer, if they were still available on ASOS I'd probably have bought a back up pair. I saw them on Erica from The Edited last year and ordered them straight away. My friend saw them on me and bought them too. I just think they're so unusual with the colourblock acetate frames and such a flattering shape on my face. I have my eye on these amazing colourblock ones from & Other Stories for this Summer. I've featured the bag and boots here already, I love finding new ways to wear the items in my wardrobe. For me, it's not possible to wear completely new outfits all the time. The average person doesn't have the means to keep up with that kind of lifestyle either and it promotes fast fashion which I'm trying to steer away from (new H&M earrings aside). I've been cutting down my wardrobe significantly over the past few months, donating A LOT to charity and it doesn't mean the I have less to wear. 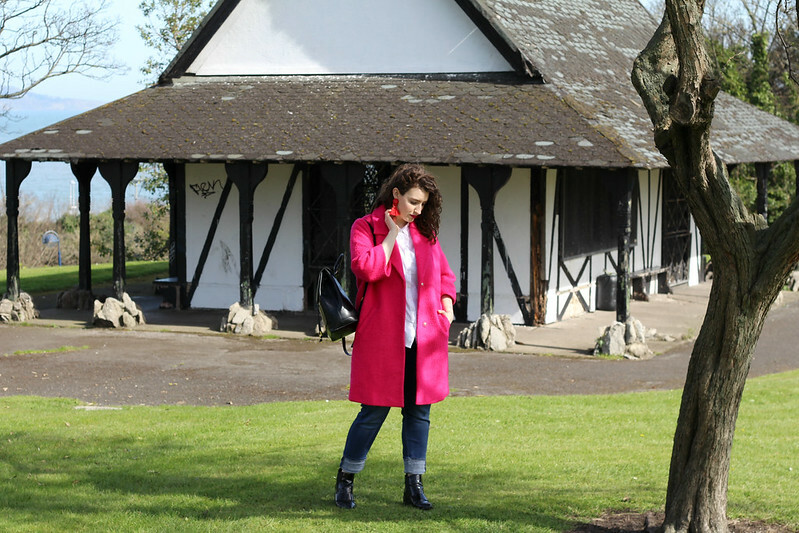 I love seeing the creative outfits of people who have a capsule wardrobe, I'm not quite there yet but I'd love to have something along those lines myself. I'm so happy Spring is finally here and the sun is out again! At the moment I'm gearing up for my trip to New York which is is just over three weeks time. If you have any suggestions of things to do or places to eat please let me know, I still have so much planning to do! I hope you're all having a lovely Sunday and enjoying the nice weather.